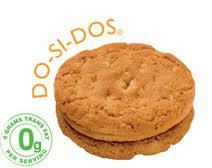 Do-si-dos are a brand of cookie that the Girl Scout’s sell. Every year, in the beginning of the year, Girl Scout’s sell their cookies as a fundraiser. I just recently had some Do-si-Dos (Girl Scout Cookies) and now I am hooked. Do-si-dos Girl Scout cookies (by Little Brownie Bakers) are also called Peanut Butter Sandwich cookies by ABC Bakers. They are very good, especially if peanut butter sandwich cookies are a favorite! Homemade Do-Si-Dos Girl Scout Cookies with egg, sugar, oats, brown sugar, peanut butter, salt, baking powder, cookies, and all purpose flour.